Candy Crush Saga may have reached peak popularity, with quarterly spending declining over the past eighteen months, but that hasn't stopped the sweet-swapping puzzle game from raking in the cash. Candy Crush Saga players still spent over $1.3 billion on the game in 2014 alone, according to The Guardian, with dollars being used towards in-app purchases such as extra lives, extra moves, color bombs, lollipop hammers and gold bars. 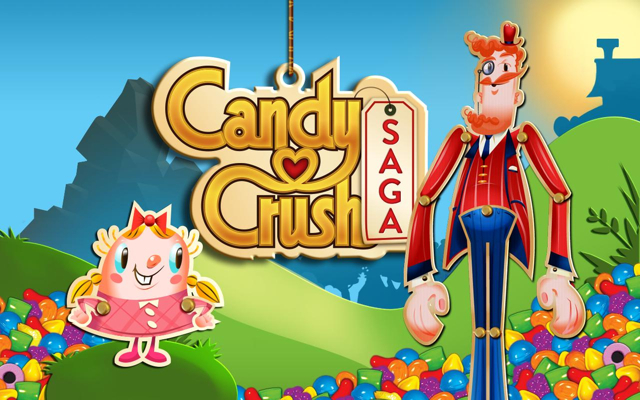 Candy Crush Saga continues to be the third-highest grossing app in the United States, closely trailed by Candy Crush Soda Saga at sixth overall. The game has gained a cult-like following since launching on the App Store in June 2013, following in the footsteps of other smash-hit games such as Infinity Blade and Angry Birds. The game was most lucrative when it pulled in $551 million during the third quarter of 2013. The latest financial numbers from King, the developer of the game, reveal that Candy Crush Saga represented 45% of spending on the company's games during the final quarter of 2014, the first quarter in a long time that the iconic title did not make up the majority of its revenue. King has been working to diversify its gaming portfolio so that it relies less on Candy Crush Saga to remain profitable. The company had 356 million monthly unique users playing its games last quarter. Earlier this week, Apple introduced a new category on the App Store to promote games without in-app purchases. The "Pay Once & Play" section offers a range of titles that are organized into the following categories: Recent Releases, Blockbuster Games, and App Store Originals. Some of the featured titles include Thomas Was Alone, Minecraft - Pocket Edition, Hero Emblems, Threes, Blek, and Goblin Sword. Don't forget that the "mium" in "Freemium" means "not really". There was an entire episode of South Park on how the Freemium industry works this past season. Hilarious. The whole season is worth watching - a lot of the best episodes they've had in years. I have never made an IAP and never will. 99.5% of my games which includes full games as well i've acquired, free. I've never bought a game IAP, but I've bought IAPs in a few apps like Paper, where you're unlocking a feature or removing a limitation. With no native app store support for trial periods, it's a reasonable way to have a free trial or "lite" version of an app. My mom buys IAP all the time. My brother would do the same thing if he had a credit card on file on his account too. I took mine off the first time I saw him do it, and I don't let my mom use my card anymore because she was just racking them up. Most of the people who do it have no value of money. If they weren't spending the little they have on this stuff, they'd find somewhere else to throw it away on. It's not like G5 Games, Big Fish, and all those other publishers that have like hundreds of games haven't been doing the same thing over the years. It's a business model, and it works. I don't agree with it, but I'm already doing something about it by making sure I'm not wasting my time with them myself. Everyone in my house already thinks I'm weird, lecturing them on this stuff won't do anything except make me walk out of the room very angry for even trying. I buy lots of apps and make lots of in app purchases. Often I find the apps I enjoy most and that are the most helpful for me cost money... But to each his or her own. That said... I tried Candy Crush and just couldn't get into it even when it was the only app to play on a 4 hour airplane flight. Why are so many posters against IAP? The devs that offer IAP have families to feed too. If they feel that IAP will offer a higher revenue stream, what harm is that? If the negative comments are more about the amount wasted on a well-designed but mediocre game, well that's just the reality of all creative industries: the generic, bland, mass appeal stuff tends to be what makes most money. Maybe because they lack the self-control to avoid indulging in IAP, or they have kids who access their devices unsupervised and rack up purchases. I've never bought an IAP for a game. I play Candy Crush Saga (I enjoy the mindlessness of it) and never felt the need to purchase anything. In one sense, Apple is to blame because they don't offer the option for "demos" and they probably receive a cut from every IAP and have a vested interest in allowing that option.